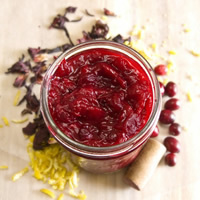 Cranberry sauce has a similar flavor to Caribbean sorrel and hibiscus drinks. Here's a great way to make a traditional dish in an untraditional way. Place hibiscus leaves and clove on a piece of cheesecloth and tie into a tight bundle. Set aside. In a medium saucepan, combine orange juice, red wine, water, and brown sugar. Bring to a boil over medium high heat. Add hibiscus clove bundle to the liquid and boil for 2 minutes. Stir orange zest into mixture and add cranberries. Bring mixture back to a boil. Reduce heat to low, cover, and simmer for 8 minutes until the liquid reduces. Pour cranberry sauce into a mason jar and let cool uncovered. Store in the fridge for up to a week before Thanksgiving.